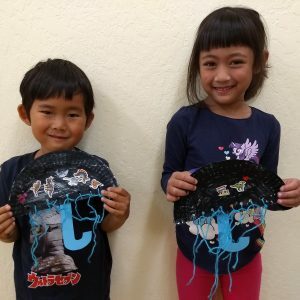 SUMMER 2019 Registration opens January 1st ! Browse below…there’s lots to choose from. Registration opens on Jan 1st. Register to create your profile and reserve your camp spot! You will receive a confirmation from our Arts Administrators in the New Year. Registration will hold your camp reservation. Non-refundable after March 1st. 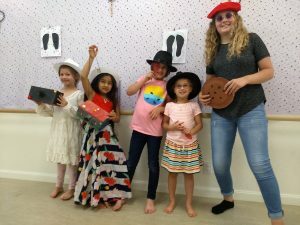 Ballet Intro / Tap / Tumble, Music & Storytime! Current Student in these programs? Your lesson time is reserved year-round ~ No registration required. Vacationing during Summer Term? Make-up classes available. 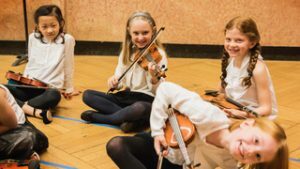 Our dynamic, talented teachers work with students of all ages ~ inspiring, motivating and creating that magical connection with a life-long pursuit of music. There is an excitement here at Myriad! Students and Families alike can feel the community spirit here, and the caring environmnent of musicians and dancers who love the art of teaching as much as they love their craft. Join us this summer ~Meet your musical mentor today! Are you taking band, orchestra, or choral music at school? Sharpen your skills over the summer with private lessons and “WOW” your school director when you return in the fall! Private lessons are the way to gain skills and get to the next level. 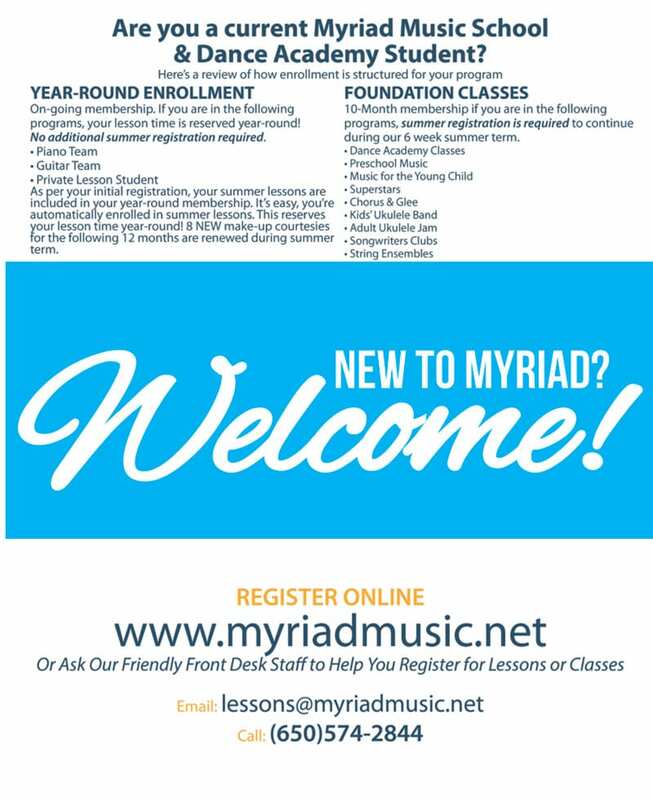 Brand New To Team Classes or Private Music Lessons at Myriad Music School? To reserve a spot with us, call our front desk staff to see what times are available for our popular Private Lessons or Team Classes. 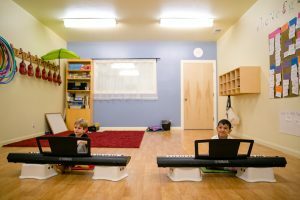 The perfect elementary piano, guitar or violin class with both ensemble and private lesson focus! 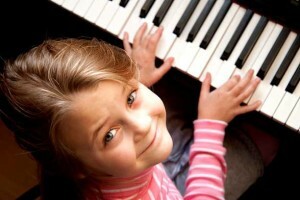 Piano Team is for our elementary-level pianists, ages 6-9. Guitar Team is for our budding young guitarists, loving the both the collaboration of teammates, while still getting their private lesson assignment too. Violin Team is a cozy, fun-filled, intimate class for our beginning string players. These students are getting that important early-stage togetherness with a classmate, while still getting lots of personal coaching. Our Team students love the balance of this format! 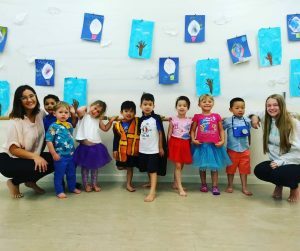 Team Classes provide a small group setting (a cozy 2-4 children per class), while also providing personal weekly private lessons. We’ve observed for over a decade at Myriad that Team Students tend to be more engaged and resilient in the early stages of learning their instruments’ challenges. 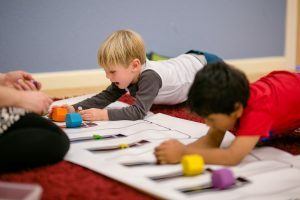 Teams are fun, unique piano, guitar or violin classes where students learn correct technique and postures from the start, learn to read music, and have fun with our collaborative music theory & skill games. Individual home- play assignments are tailored to the child. Students progress at their own rate. Piano, Guitar & Violin Teams plant the seeds for happy, resilient learning, motivating young beginners for years to come! Performing Arts Camps. This is our 8th year offering this popular program. BENEFITS for you! All of your child’s performing arts summer activities in one place! We allow the flexibility of weekly enrolment and incentives for camp families who sign up for more than 2 weeks & friend referrals. TUITION: Includes Registration & Materials Fees. Option 2: REFER A FRIEND! If your friend registers with your referral, both families receive $25 discount for one camp’s tuition. 6 different unique weekly themes. Music / Dance / Yoga / Art / Theater Performance Combo Camps! A different unique theme each week. Students rotate daily through Music, Dance, Art & Theatre classes with an end-of-week presentation for loved ones. 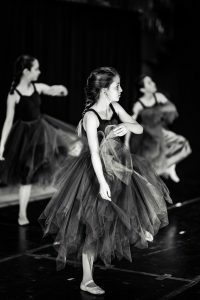 Small camp sizes with highly skilled, experienced music, dance, and theatre Teachers. Our Camp Leadership Team is comprised of enthusiastic, skilled and professional teaching / performing artists. 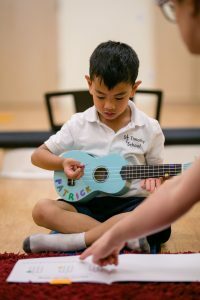 Music: Our campers sing, explore keyboard skills, play glockenspiels, ukuleles and percussion instruments, preparing the musical components that will be featured in the theater presentations. 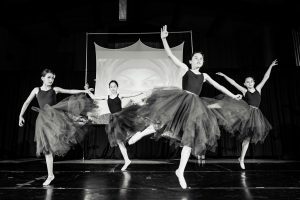 Dance: Warm-ups, yoga and choreography give our campers a healthy daily experience with flexibility , body-awareness, coordination, and varied choreography. Art: 3-4 themed art projects are enjoyed throughout the week. Theater: Story-telling, character play and theater skills. We write customized, cute, themed plays, tailored to our age groups. Bonus Activities: Instrument Petting Zoo, story time, big-life journalling, craft stations, campfire sing-a-longs, scavenger hunts, parachute time and much more! Week 1: June 24 – June 28 Jungle Mania! Week 3: July 8 – 12 Oceans & Islands! Week 4: July 15 – 19 Earth’s Mightiest Heroes! Week 6: July 29 – Aug 2 “Eye Spy” ~ Detective Agency! Do you have a precocious teen who loves working with younger children & wants to develop no-fail leadership skills for a life-time? This summer program is for organized, resourceful future leaders who love the creative arts environment, and are excited about inspiring through teaching! Welcome to an amazing mentorship program for teens aspiring to gain and develop leadership skills in the arts, in a classroom setting. Leaders-In-Training spend camp first actively learning in Leadership Classes. They will then execute their objectives in our Performing Arts Camps, alongside real students, mentored by credentialed, certified teachers. Throughout the week, leader-in-training will receive mentorship in communication, awareness, goal-setting, lesson planning, management skills and much more! The secrets to strong, effective leadership qualities! This is an integral set of skills important for for every middle and high school student to acquire. This program features professional skills many of our seasoned teachers wished had been available to them in their teen years. Often, this kind of training is not offered until college or post-college years. This program is an amazing short-cut to the most valuable aspects of leadership through the art of teaching. Components you will learn in this action-packed week-long camp! Leadership & Awareness: Our leaders learn how to identify & use effective language, tone (empathy) and body awareness. Sequencing & Scaffolding: Leadership through teaching has everything to do with building process, and knowing the ages being targeted. This is the one of the most important qualities of a seasoned teacher – we have short-cut secrets! Lesson Planning formats that are in sync with educational trends today! Classroom Management: Using enthusiasm, organization, and pacing to maintain positivity and organization. Flexibility & Spontaneous Assessment / Re-Direction, a crucial survival tactic for all team-builders, public speakers & educators. Recommendation Letter to use for future employment, program applications, college applications, etc. On-going recommendation support. Myriad’s Directors will continue to support you with requests for on-going future recommendations, documentation, etc. We have limited enrollment for these camps, so we can provide close mentorship, targeted assignments and personal assessments for each teen. TUITION: Includes Registration, Materials Fees, and Take-Home-Resources. Teens ages 16 & up: Contact us to learn more about how to take this camp for free & earn your community service hours, with all of the training benefits. You can choose your week. We will put you in touch with our Camp Director. OR…New to Myriad? Email or call our Arts Administrators to learn more about meeting our summer coaches now for an informal audition. Our coaches are awesome at creating a special experience for all! 2 years or more of private lesson experience required to join this Summer Combo Class. 2 years or more of private music lessons and/or Intermediate level skills are required to join our summer combo class. Each day the instructor will cover different aspects of playing in a band (arranging, improvisation, chord progressions, soloing, etc). Both jazz and rock styles will be covered. Band members go home with a recorded demo at the end of the week. Come and rock out with our Jazz / Rock Combo Coaches! Open to Guitarists, Pianists, Ukulele Players who have been enrolled in private lessons for 2 or more years and have some jamming skills! All musicians grow more proficient in a group setting. Summer Rock/Jazz Combo is the perfect setting to workshop these skills and explore tunes together with other players! Combo jammers will work on playing with a unified band sound, developing a solid, musical “ear” when playing with others, play familiar rock chord progressions, experiment with improvisation, and gain confidence with their instrument. Our seasoned Jazz / Rock Band Coaches will highlight the strength of each player while working on tunes that inspire the campers. 4 years or more of private lesson experience required to join this Summer Chamber Music Class. 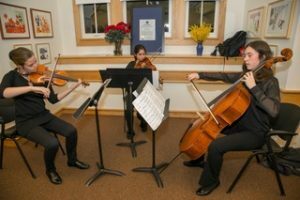 Chamber music is an intimate form of classical / art music composed for a small group of musicians. It’s often described informally as “the music of friends”! And that’s exactly what this summer music class is all about. Classical musician Teacher Justin will select chamber music to suit the instrumentation represented. The Chamber Music Ensemble members will be assigned parts, rehearsing their selections over the course of the the Summer Term. 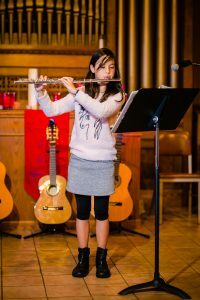 Ensemble skills will include how to play and listen for balance, blend, and match intonation among the different instruments. Locking into tempo and phrasing together (as a sophisticated ensemble does!) will complete the masterpiece! Members go home with a recorded session at the end of the week. All musicians grow more proficient in an ensemble setting. Summer Chamber Music Ensemble is the perfect setting to workshop these skills and explore tunes together with other players! 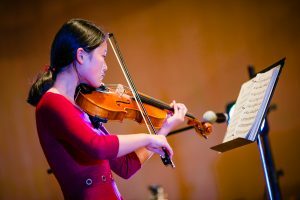 Our seasoned Chamber Music Coach will highlight the strength of each player while working on repertoire that inspire the campers. Have a blast with the dynamic Teacher Dan, exploring and discussing the dramatic, emotional impact music and sound effects have on movies. 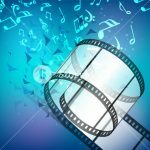 Throughout the week, campers shoot their own home movies and then learn how to compose & superimpose their own soundscapes and music tracks together, fusing this with their own personal movie. Compositional and technical components are taught and brought together during camp time. Educational aspects include music technology, sequencing, recognizing how modes effect emotion in sound tracks, improvisation, texturing & layering sound, and video / sound editing. All musicianship levels are welcome – Teacher Dan will create the magic to help imagination and vision come alive. Families join us on the Friday for movie viewing and popcorn! This is an intimate class size of no more than 12 campers. 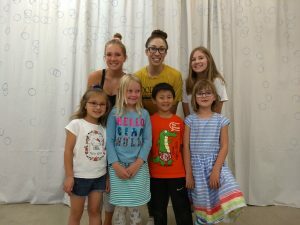 Summer Dance Camps & Classes: Ages 3 & up! Join us for our 6-week Summer Dance Term. Below is our weekly dance class schedule. Browse further to also learn about our Dance Camp option. Stay fit over the summer, with grace, strength, and style! 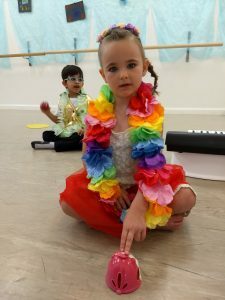 Summer is all about dance skills with a fun twist! Bring a friend to dance with you at Myriad this summer! Refer-A-Friend Program – ask our front desk for info. Call our friendly front desk staff at 650-574-2844 to reserve your summer class time. Discounts: 10% off your 2nd dance class. Students taking 1 or more dance classes this summer are eligible for our STAR Dance Program. 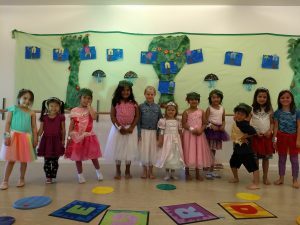 Summer Pre-Ballet / Tap & Tumble! An exclusive class for our Dancers ages 7 & older, enrolled in at least one Summer dance class. 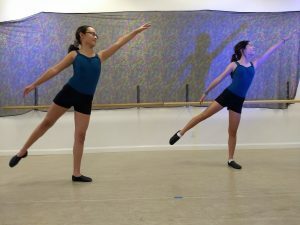 Turns & Leaps focus on perfecting the execution of turns (like pirouettes, pencil turns, etc) and leaps. Tricks focus on stage presence and special moves that showcase talent and ability. A fantastic supplement to your ballet, jazz or contemporary class. STAR classes are offered at a discount, when combined with another class. Intensives are fun & focused experiences, making a lasting impact for the coming year of dance skill growth. 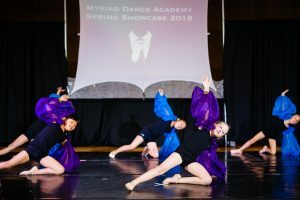 Myriad’s Intensive Summer Camp is for dancers who are serious about improving their technique in a variety of styles. Camp features daily yoga/pilates/fitness classes and 2 technical dance sessions per day. This is an intimate class size of no more than 8 dancers. Language of Dance Movement Alphabet (LOD) is a special feature of Myriad’s Dance Intensive Camps for our dancers who are ready to take it up to the next level. b. Technical Class #1 Ballet Foundations. Using Ballet alignment, footwork and classical positions and understanding how this is the foundations to all styles of dance and movement. Technique refinement and strengthening. c. Introduction to Language of Dance Movement Alphabet (LOD). Students will learn a new symbol system/choreography language as a compositional tool. Dancers create their own movement and phrase work. This class has it all! Music notation, rhythm skills, coordination, pattern work, stretching, ballet intro, hippity-hop intro, and tumbling! 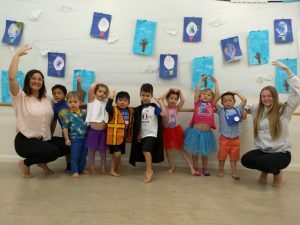 A combination class of our 2 popular preschool classes. Certified Music & Dance teachers share this class. 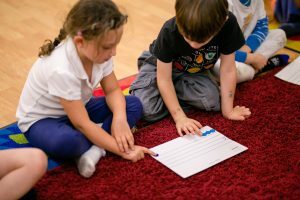 ABC Music & Me Preschool Music featuring keyboard exploration with our animal alphabet and music booklets, mallet instruments, keyboards & ukuleles, PLUS our Pre-Dance & Tumble curriculum. Plus a relaxing story-time between classes. The perfect afternoon class for your pre-schooler, and a great introduction to our School Year curriculum for pre-schoolers starting in the fall. 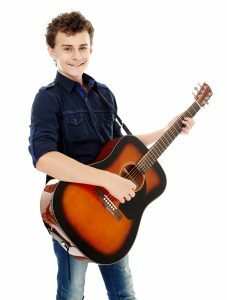 This popular curriculum gives children pre-piano & pre-guitar skills. Students learn note & rhythm reading in a small team setting. 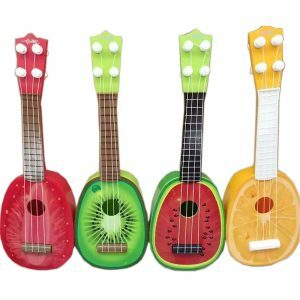 Instruments used in class are keyboards, ukulele, mallet instruments & percussion. Home practice Summer piano booklets included. 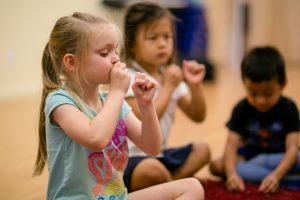 The perfect afternoon class for our Young Musicians , and a great introduction to our School Year curriculum for Kinder and young elementary level students starting in the fall. Presentation for loved ones at the last class. Unique to Myriad—another popular choice! 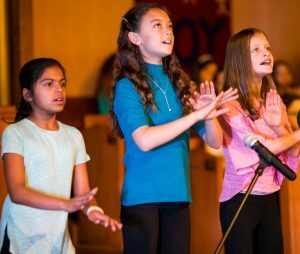 The exciting, “trifecta”, featuring the 3 most dynamic areas of music education for young musicians: Piano skills, ukulele jamming, and our mini-glee chorus ~ all in one well-rounded class. Reading notes on the staff in our awesome piano books, counting rhythms, piano finger numbers, ukulele plucking and strumming techniques, safe vocal technique, vocal diction, and singing on-pitch….WOW! This class has it all! Your music enthusiast will gain foundations in all 3 disciplines. This summer sampler is just the tip of all of the savvy goodness there is to learn in this unique Myriad creation. Get a summer head start on being part of our fall-start, school-year SUPERSTARS! Level 2 by Teacher’s Recommendation only. Strummin’ & Pluckin’! For both new & continuing students. Students read ukulele notation and gain ensemble skills in this fun setting. 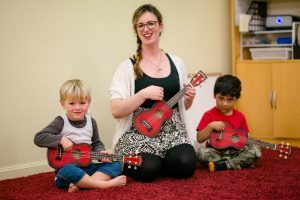 Keep your ukulele skills up this summer! A special offer for mature teens, adults, parents of our music school students and someone you know who would enjoy this too! Anyone 16 & older is welcome to join our Adult ukulele jam. Bring a friend – it’s fun to make music with friends. 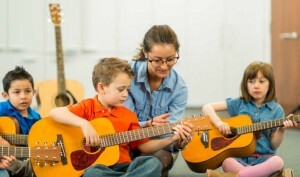 The teacher is helpful , encouraging, and the emphasis is on having a good time while learning some music basics, or further developing any skills you may already have. There is a role for everyone in this setting. 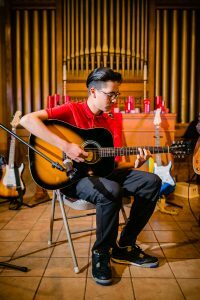 You could learn basic strumming, learn how to pluck, or learn how to solo, depending upon your comfort level and skills coming into the class. The main thing is that you get to make music with others in a welcoming environment. Everyone can do it. For Continuing and New Students. Singing in the summer is a joyful activity. Bring a friend! Learn how to sing properly with breath and tone support, while singing with fun back-tracks and microphones. Ensemble, solo and back-up singing skills. Glee choreography too! Keep your singing skills sharp this summer. Fun, energetic class, with seasonal song picks. Great preparation for school musicals or for continuing with Myriad’s Chorus and Glee Programs in the fall.